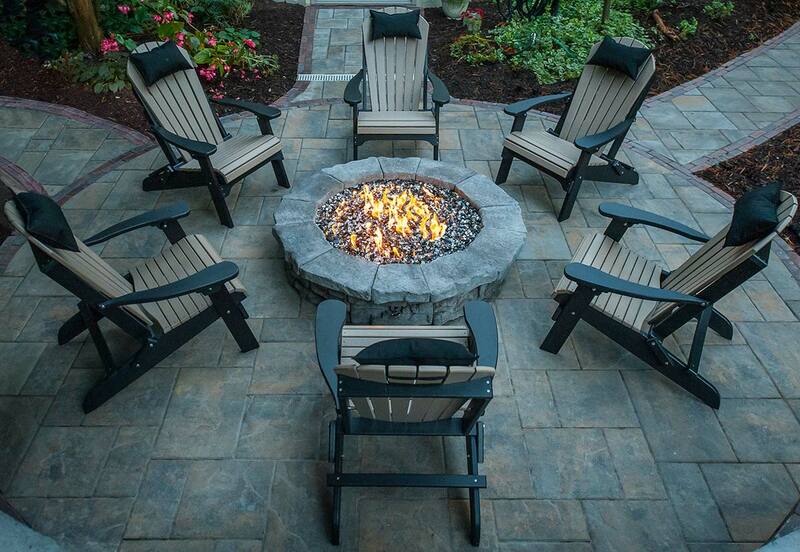 What’s better than a fire feature on your back patio? A fire feature that’s accented by shimmering glass, gently trickling waterfalls, and gorgeous custom stonework. This description sums up a recent project completed by Gill Landscape Contracting of Moon Township, Pennsylvania. 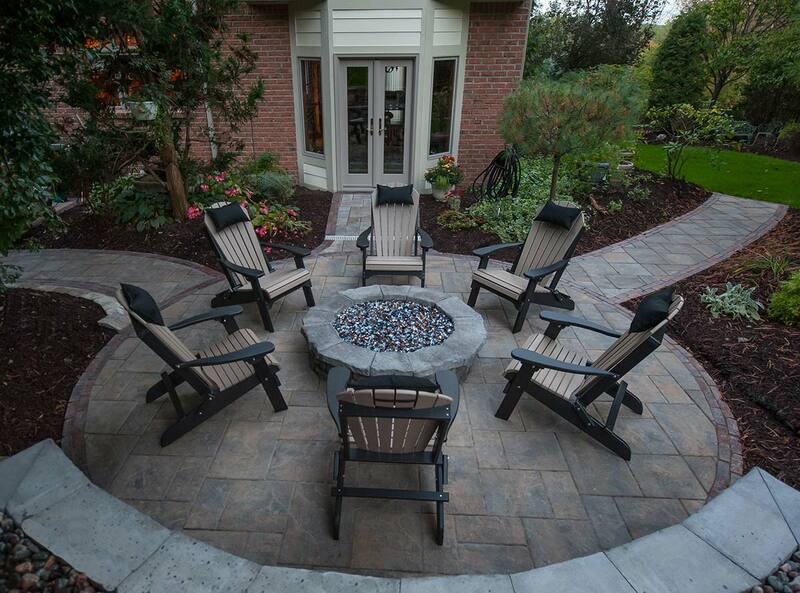 With a gas fire pit centerpiece and lighted water feature, this outdoor space is the ultimate destination for entertaining guests or for kicking back and relaxing on a quiet summer (or even winter) night. Using several contrasting shades instead of one adds visually compelling texture and depth that’s further enhanced by the fire. 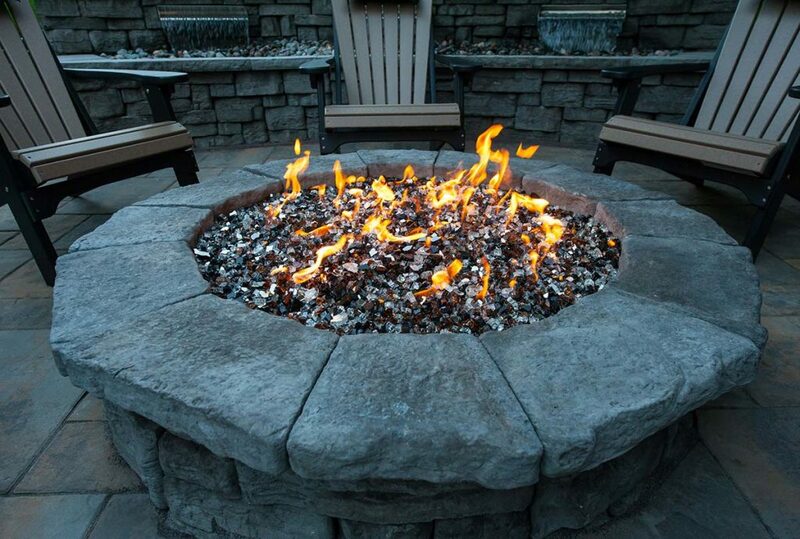 The copper, diamond, and black colors seem to spring to shimmering life beneath the flames! 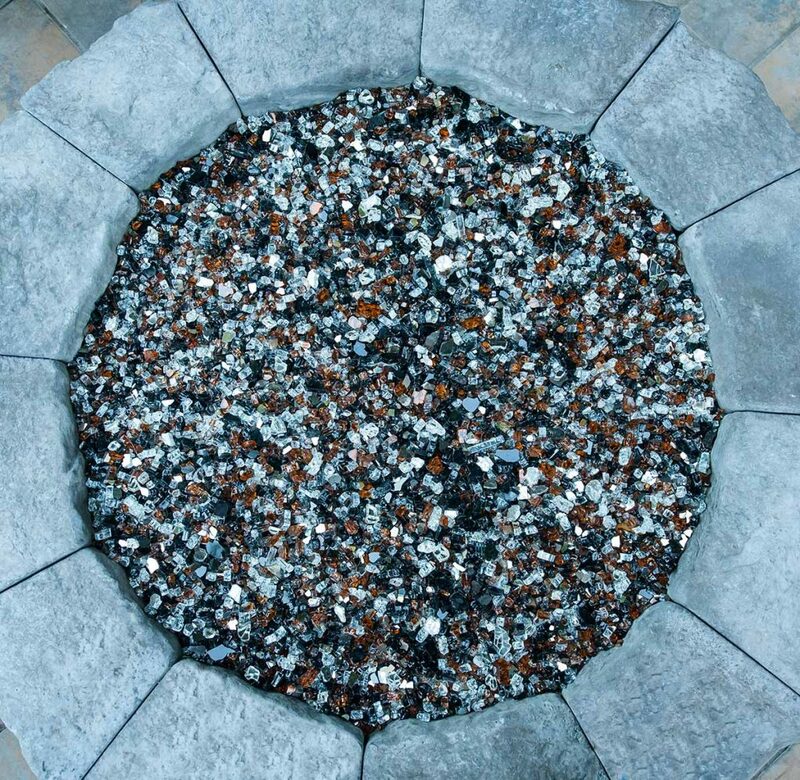 Gill Landscaping used R.I. Lampus Rosetta Dimensional blocks in a charcoal color to create the fire pit and retaining wall / water feature — it’s a wise choice that really sets off the fire pit glass. 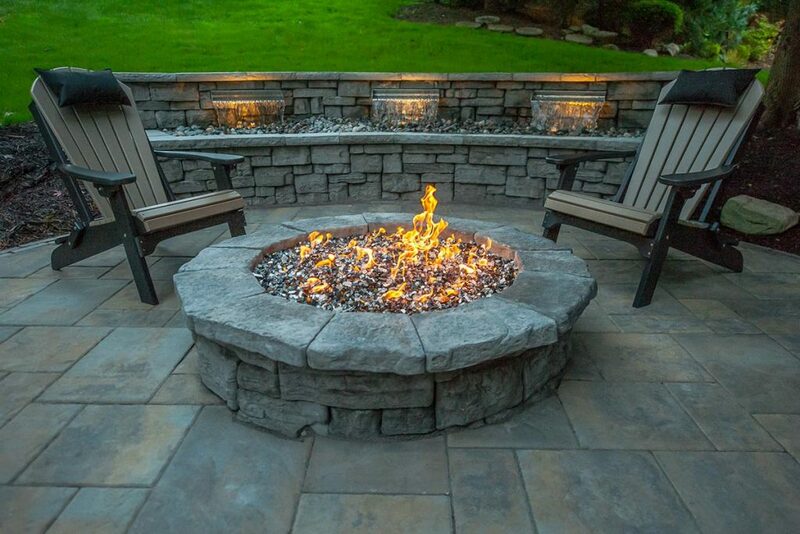 Why Was Tempered Fire Pit Glass Chosen? Extreme durability: While regular glass would crack, pop, and melt under the flames, tempered fire pit glass is specially engineered to withstand searing temperatures. It won’t disintegrate — even over time. Cleaning-burning nature: Tempered fireplace glass doesn’t produce harmful, smelly smoke or fumes and won’t result in the ash or soot that occurs when you’re burning wood. That means you can use it around your family (including small children) with complete peace of mind. Exceptional glimmer: Like all Celestial Tempered Fire glass, the glass used in this project is not tumbled; instead, it underwent a special process that removes very sharp edges but retains an ultra-smooth and highly reflective surface. This glass also features a mirror backing on every piece, which amplifies the glitz. Serving the greater Pittsburgh area, Gill Landscape Contracting specializes in creating custom landscaping designs for both residential and commercial clients. They blend creativity with years of know-how to accommodate each client’s unique tastes and budget — all while focusing on delivering a superior level of customer service.